Ok, so apparently I bought like 85 pounds of turkey for like 4 people. Who knew I was so bad at estimating how much people would eat?! And now I have like 84 pounds of turkey just sitting in the fridge, waiting to go bad–because it’s not like we’re going to re-do our holiday dinner every day for the next month. Wasting that much food though–the HORROR! 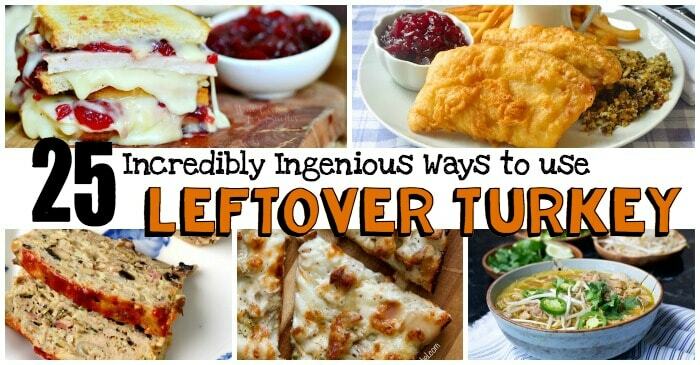 So, I found these 25 Incredibly Ingenious Ways to Use Leftover Turkey to keep me from feeling the throw-away-the-turkey-blues. And they’re super-yummy. Bonus! You’re gonna have to chill-out on the ham and get me a bowl of this Chili with a Turkey Twist. Turkey Hash is all it promises and more. I’d like to eat, eat, eat this Pot Pie Soup with a banana (not really). Even if you’re not on the border, these Enchiladas will take you there. This 15-Minute Turkey Pho is where it’s at. 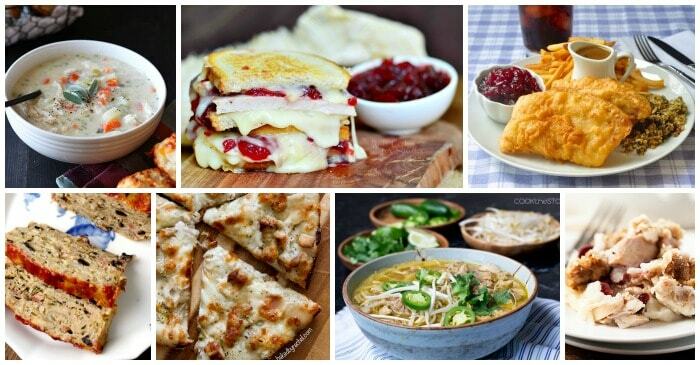 Turkey Cranberry Monte Cristo Sandwiches. Be still my beating heart. Gimme those Wedge Pies and no one will be hurt. Turkey-Cranberry Strudel. It’s what’s for breakfast. Easy Tetrazzini is a recipe dying for leftover turkey. For this Casserole, my kids will “save” their turkey helping…heh. My mamma’s Turkey Meatloaf is totally gobble-worthy. I’d eat this Dinner Stack any day–but especially Friday after Thanksgiving. Just sayin’. Nothing beats this recipe for Beer Battered Deep Fried Turkey. Cheesy Turkey-Ranch Quesadillas are a treat–like Mexican pizza–only not a tostada, which is what is really Mexican pizza. Oh, just have some Turkey Pizza and stop worrying about what’s Mexican pizza and what’s not. Turkey Alfredo Ziti gets us some Italiano in the mix. Easy 3-Ingredient Turkey Stew is so fast, it’s furious. Heh. Turkey and Taters Empanadas. GAH! We’re back at Mexican food again! LOL! Take that Mexican food! I’ll have a Turkey Cranberry Brie Grilled Cheese, if you please. Easy Kabobs make for a fast meal that the kids will love to scarf-down. Turning leftover turkey into Smoked Buffalo Turkey Dip turns your main course into an appetizer–magic! These tasty little Spring Rolls would be awesome with spicy chili sauce. Or cranberry jelly. Whatever. Savory Crepes are an awesome breakfast that everyone will love. Nothing beats a big-ole Stromboli comin’ out of the oven. Turkey and Stuffing Dumpling Soup is an interesting and kinda cool take on the chicken-and-dumpling recipe.